(Analog speed meter type) If a few seconds have elapsed after switching the ignition off, the needle may deviate. However, this does not indicate a problem. 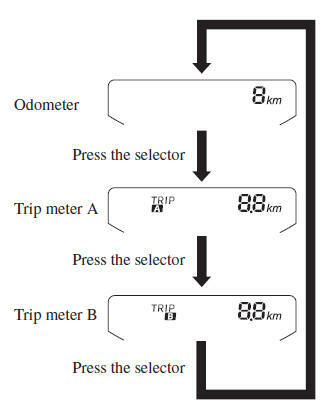 For instance, trip meter A can record the distance from the point of origin, and trip meter B can record the distance from where the fuel tank is fi lled. 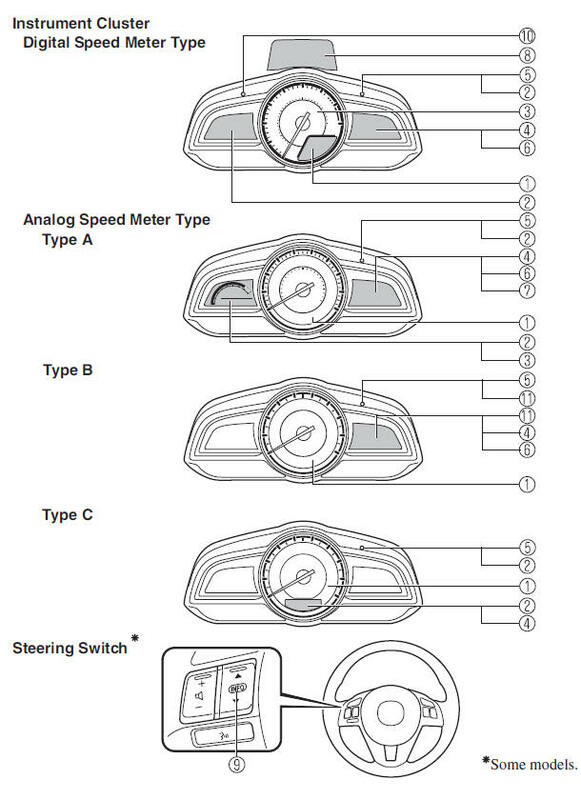 (Vehicles with type C/type D audio) If the fuel economy data is reset using the fuel economy monitor, or trip A is reset using the trip meter when the function which synchronizes the fuel economy monitor and the trip meter is on, the fuel economy data and trip A are reset simultaneously. 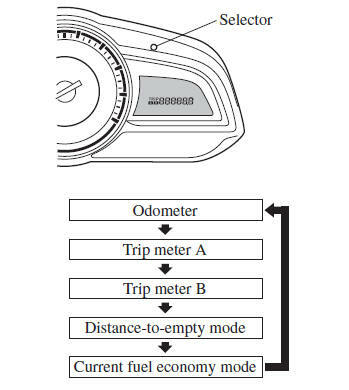 Refer to Fuel Economy Monitor on page 4-89 . 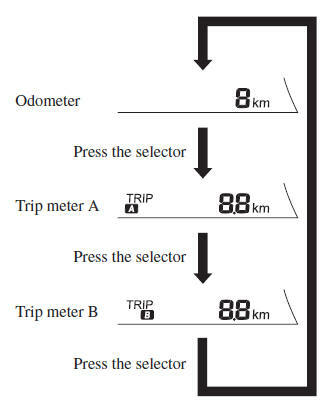 Only the trip meters record tenths of kilometres (miles). The following information can be selected by pressing the selector with the ignition switched ON. If you have any problems with your trip computer, consult an expert repairer, we recommend an Authorised Mazda Repairer. Even though the distance-to-empty display may indicate a suffi cient amount of remaining driving distance before refuelling is required, refuel as soon as possible if the fuel level is very low or the low fuel warning light illuminates. The display may not change unless you add more than approximately 9 L (2.3 US gal, 1.9 Imp gal) of fuel. The distance-to-empty is the approximate remaining distance the vehicle can be driven until all the graduation marks in the fuel gauge indicating the remaining fuel supply disappear. This mode displays the current fuel economy by calculating the amount of fuel consumption and the distance travelled. 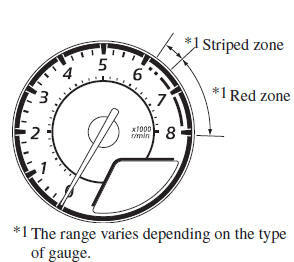 When the tachometer needle enters the STRIPED ZONE, this indicates to the driver that the gears should be shifted before entering the RED ZONE. After refuelling, it may require some time for the indicator to stabilize. 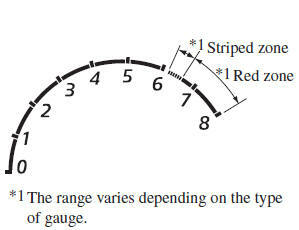 In addition, the indicator may deviate while driving on a slope or curve since the fuel moves in the tank.
) indicates that the fuel-fi ller fl ap is on the left side of the vehicle. If inconsistency in engine performance or stalling occurs due to low fuel level conditions, refuel the vehicle as soon as possible and add at least 10 L (2.7 US gal, 2.2 Imp gal) of fuel. switched ON, the brightness of instrument panel illumination is dimmed. The brightness of the instrument panel and instrument panel illuminations can be adjusted by rotating the knob. The brightness decreases by rotating the knob to the left. A beep sound will be heard when the knob has been rotated to the maximum dim position. The brightness increases by rotating the knob to the right. ignition switched ON. 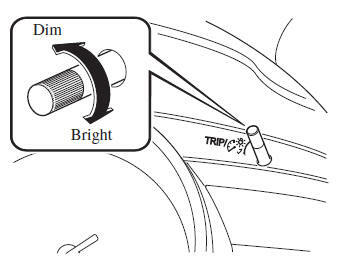 If the instrument cluster's visibility is reduced due to glare from surrounding brightness, cancel the illumination dimmer. When the illumination dimmer is cancelled, the screen in the centre display switches to constant display of the daytime screen. Signifi cantly cold or hot temperatures. Sudden changes in outside temperature. The vehicle is driven at low speeds. The vehicle speed preset using the cruise control is displayed. INFO switch with the ignition switched ON. The distance-to-empty is the approximate remaining distance the vehicle can be driven until all the graduation marks in the fuel gauge (indicating the remaining fuel supply) disappear. This mode displays the average fuel economy by calculating the total fuel consumption and the total travelled distance since purchasing the vehicle, reconnecting the battery after disconnection, or resetting the data. The average fuel economy is calculated and displayed every minute. After pressing the INFO button, - - - L/100 km (- - - mpg) will be displayed for about 1 minute before the fuel economy is recalculated and displayed. This mode displays the average vehicle speed by calculating the distance and the time travelled since connecting the battery or resetting the data. After pressing the INFO button, - - - km/h (- - - mph) will be displayed for about 1 minute before the vehicle speed is recalculated and displayed. In this mode, the current setting for the vehicle speed alarm is displayed. You can change the vehicle speed setting at which the warning is triggered. The vehicle speed alarm display is activated at the same time the beep sound is heard. The set vehicle speed fl ashes several times. The vehicle speed alarm can be set using the INFO switch. Always set the vehicle speed according to the laws and regulations of the country/city in which the vehicle is driven. In addition, always verify the speed of the vehicle using the speedometer. The vehicle speed alarm function can be set between 30 and 250 km/h (20 and 150 mph). 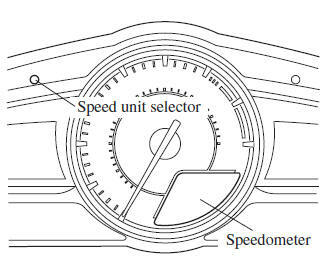 The vehicle speed alarm can be set using the following procedure. Press the INFO switch on the speed alarm screen. Select ON and press the INFO switch. Set the vehicle speed by pressing the INFO up or down button, and then press the INFO button.